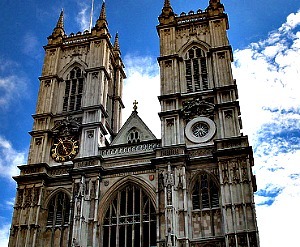 Westminster Abbey tours is a most if you are visiting London for the first time and looking for things to do in London! Richard Jenkyns in his book with the same title, describes Westminster Abbey as "the most complex church in the world in terms of its history, functions and memories – perhaps the most complex building of any kind.". If you are looking to see the unfolding of over 900 years of history in front of you, book a ticket now to see Westminster Abbey London. Founded in 960 by Saint Dunstan, and rebuilt by Edward the Confessor in 1065, this most magnificient edifice has become not only the largest nave in England, but houses the remains of over 3000 of Britain's greatest Kings, Queens,soldiers, inventors, scientists, writers, poets, philosophers, prime ministers, priests and the likes. It is also a true masterpeice of ancient Gothic architecture. No one ever gets bored visiting this exceptional London attraction, as you can never be sure of whose ghost you might meet on the corridor. Other notable tombs of interest to visitors are those of Charles Darwin, James Clerk Maxwell(discoverer of electromagnetic theory, which later lead to radio and TV), Charles Dickens, Geoffrey Chaucer, Dr. Samuel Johnson (creator of the first English dictionary) and King Henry III, for example, who reigned from the age of nine for 56 years. You could easily spenda whole month on Westminster Abbey tours digging into past and contemporary history, of you are an avid lover of the records of days past. Where is Westminster Abbey? The Westminster Abbey is located to the side of Parliament square in Westminster, London. The Abbey is easily reached by the Vitoria Line on the London Underground subway train system popularly referred to as the tube. Alight and exit at the St James Park stop. Westminster Abbey opening times is from Monday to Saturday throughout the year. On Sundays and religious holidays such as Good Friday, Easter and Christmas, the Abbey is open for worship only. It is also closed during during ceremonial events and services. You can get a Westminster Abbey tour ticket for free and save £16 or more, by getting an all inclusive London Pass . That means that you could visit top attractions in London, like the Tower of London, Kensington Palace, St Paul's Cathedral, Windsor Castle, London Zoo, the London Aquarium and Shakespeare's Globe – to name but a few for one price. Alternatively, you may want to get your Westminster Abbey tickets directly from Westminster Abbey Tours website for £16.00 per adult and £6 for 11 to 18 year olds. Under 11s go free as long as they are accompanied by an adult. family tickets exists. A family of 2 adults and 1 child pays £32.00 while a family of 2 adults and 2 children pays £38.00. There is an extra charge of £6 per extra child.